In “Beyond Glory,” a show about war veterans. It portrays a series of former servicemen recollecting their combat experiences and the acts of courage that won them the United States military’s highest laurel, the Medal of Honor. Two actors will portray 8 men who have won the country's highest honor: The Congressional Medal of Honor. This play tells their stories. G. K. Chesterton was one of the dominating figures of the London literary scene in the early twentieth century. Not only did he get into lively discussions with anyone who would debate him, including his friend, frequent verbal sparring partner, and noted Irish playwright George Bernard Shaw, but he wrote about seemingly every topic, in every genre, from journalism to plays, poetry to crime novels. "He said something about everything and he said it better than anyone else," declared Dale Ahlquist, president of the American Chester Society, on the society's Web site. Most of Chesterton's literary output was nonfiction, including thousands of columns for various periodicals. Personally, we find GK to be the most interesting man in the world... and he doesn't even drink Dos Equis! We love his heart-felt veneration of the common man. Chesterton’s appreciation of the common man predates his college years. His teenage notebooks are full of a reverence for ordinary people, expressed as a corollary to his reverence for the most ordinary of objects and things. Chesterton’s respect for the common man was basically a respect for free will. He said that the actions of a beggar are as momentous as the actions of a prime minister, because the beggar’s actions are no less free and have an eternal significance surpassing all merely temporal enterprises, even those of prime ministers and kings. I mean that we here are on the wrong side of the tapestry. The things that happen here do not seem to mean anything; they mean something somewhere else. This man was witty, funny, profound but most all innocently child-like. His intellect combined with this innocense makes him a most charming character. This play romps through his thoughts, his opinions, his jokes, his philosophy and his faith. You must see this play. You will be fascinated and inspired to find out more about this admirable champion of the common man. We decided to make another go of it! We had such a good time last week! We invite you to come and enjoy a breakfast at 10am and then stay for some worship at 11am. Just a bunch of strange people learning about the beauty of Jesus. The Poetry Café has also become a popular and a sought after event in the Triad. People of all different backgrounds, classes, genders and identities blend and unify through music and poetry as they showcase who and why they are. The event has become so much more than an open mic, its a catalyst for community building, a space to share dreams and ambitions, loves and frustrations. Backed by a live band, a phenomenal host and soulful vocals it is a Triad favorite. All kinds of people come to the stage with poetry, songs, monologs, dances, raps and more! This event always proves to be a powerful outlet for all involved. Poetry Café is on the third weeked of every month... you cannot affor to miss it! 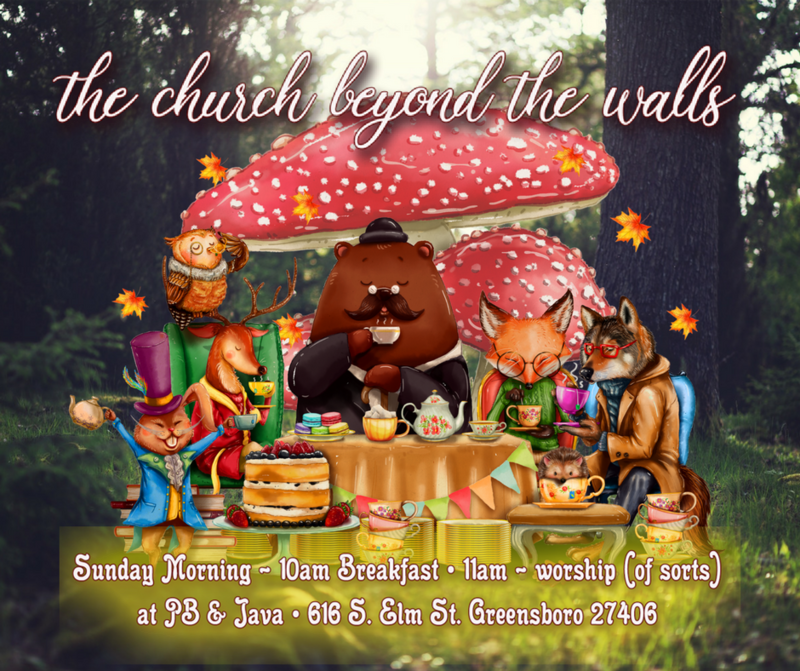 Come join us for the first Greensboro meeting of the church beyond the walls. Lee O'Hare will be teaching. Lee started a FaceBook page call "The Online Posse of Spiritual Misfits" The purpose of that group appears below. Admission is free, of course! At 10am we will serve breakfast (pancakes, bacon, eggs, grits, toast, OJ) then move to a time of learning to love God and our neighbor. The purpose of this group is to facilitate a spiritual community that would be a "safe place" for spiritual pilgrims to come and find support, encouragement and fellowship together as we seek to pursue an intimate relationship with our Abba God. Many of us have come out of hurtful church experiences and many have been burned and deeply disillusioned by "the church" and religious Christianity and yet, still love Jesus and simply long for a place to work out our spiritual issues in a non-judgmental and supporting environment. So, I have created this group to be a place where we can come together and work through our questions and support one another as we deconstruct some of our old religious beliefs in our search for a more beautiful Gospel and a more Christ-like God. While this group does not officially hold or require any particular doctrinal or theological position you will find a strong leaning towards a belief in Universal Reconciliation (or Inclusionism) and a very strong opposition to a belief in eternal conscious torment in a place called "hell". If you are not comfortable with that then this group is probably not for you. We will not tolerate those who come into this group with an agenda to "correct" our beliefs and actively promote traditional evangelical doctines of hellfire and divine retribution. "Be kind to one another; even if you disagree on stuff." .Accordingly, no name-calling, vindictive or hurtful language will be tolerated. This is also NOT the place to be proselytizing your favorite theology or pet doctrine, pushing your personal agenda or promoting your political cause. Please respect the purpose and nature of this group and we should all have a wonderful time together. Peace. Santos at PB & Java!! If you have not experienced Santos then you owe it to yourself to expose yourself to his simple, beguiling world music. You'll love every moment. Santos plays what he calls Truth Music: acoustic sounds from the Soul, for the Earth, for love, for lovers, for Spirit, for Community. When asked about his band, he said, "It's just me and all the like mind, like Vibe artists that sit-in, play, produce, compose, paint, photograph, dance, sing, and shine beside Me!" One - the best of Quing! For decades, the musical genres of Hip hop and R&B have long been combined to create classic music that spans generational tastes and personal likes and dislikes. From Mary J. Blige and Method Man’s hip hop soulful rendition of “All I Need” in the 90’s, to the ride or die anthem “On The Run” by Jay Z and Beyonce in the 2010’s, collaborations between amazing singers and gifted rappers have long topped the charts. For Greensboro, North Carolina’s group ONE, they have every intention of continuing the long tradition of creating quality music by blending soulful singing and harmonies with catchy lyrics and rap excellence. Every month, City 616 invites 60 people onto the third floor for a night filled with homemade food and hearty drink. There is time for feasting, fellowship, and talent sharing. The food is "out of this world" and the people are amazing. You will love meeting new friends and enjoying a great meal. Any guest is encouraged to share a talent: sing, dance, recite, read their favorite bit of prose or even bring artwork from home for a "show & tell." We subscribe to the G.K. Chesterton philosophy in which he rightly says, "If something is worth doing, it's worth doing badly. (For) How many of us have banished drawing, painting, dancing or singing from our lives for fear of not doing it well? If a thing is worth doing then it is worth doing for the joy of it." The Joyful Community will be rocking and bringing you some of the best talent in Greensboro, NC and surrounding cities! You won't want to miss this show as we highlight music, drama, comedy, spoken word and just plain ol' good entertainment! Don't sit at home watching the paint dry or the grass grow! Come on out and have more fun than you've had in quite a while! We will have the Polk Duo, Justin the Beloved, Marta Richardson, Rob & Diana Reade, Darren Faber, Krosswordz and the Peculiar People!! Some of the best up & coming talents in the Triad. The Cypher is an open mic poetry event for college & high school students. Come on down, sign-up for your place at the mic and let's have a great time. Every Wednesday is Wine Dowon Wednesday at PB & Java! Join your friends at Greensboro's favorite meet-up. "If I write it, its relevant to the real. My story ain't the only one I'm trying to tell... Get wit it or get lost literally"
T-Shep (Pronunciation: \ˈtē-,shep\) discovered a passion for music at a early age. Making regular trips to the local record store to keep up with the latest sounds, she landed a employment there. Then she realized it was not only listening that she enjoyed about her past time. at the age of 15 she began composing full songs and using her job as a door to gain exposure and establish respect as a lyricist. Eventually the local music scene brought about trouble in this young ladies life. Drinking and partying became the center of perusing this life long dream. T realized after numerous run ins with the law, and violent encounters, that something had to change for the better. She came to the conclusion that music played a major role in the negative influences over her life and didn't want anyone to go down the same path of chasing this fantasy dream that todays hip-hop culture promotes. In late 2011 T-Shep resubmitted her life to Christ and began doing only inspirational music. Tasha Sheppard (aka T-Shep) was raised on the east side of Greensboro, N.C. in a home that taught Godly principals to a musically inclined family. Today at the age of 26, she continues to push herself as an artist, and has promised to keep God first in her music. She states: "God gave me this gift, so every song from here on out is a dedication!" J.A.M. (Jackie, Audrey, and Mika) is the latest trio in the world of powerhouse female vocal groups. The core of our mix contains elements of the saucy doo-wop days ,dips of the most soulful parts of the musical 90's, and the new passionate sounds such as Marsha Ambrosious and Ledisi. Greensboro Grooves Special Edition: Women Songwriters Showcase!! Greensboro Grooves is a podcast that showcases the amazing talent and diversity of the North Carolina music scene. Join us for a live recording session and interview of artists and songwriters. Find our podcast, Greensboro Grooves on SoundCloud and iTunes to keep current with your local music scene. But this is a special Greensboro Grooves!!!!! Women Songwriters Only performing! This event was such a big hit last time, everyone wanted to bring it back!!! So come on down for some of the most talented gals in the Triad!!! Push it to pop it! Rock it to lock it!! Break it to make it!! C'mon, now! You know we got the moves at PB & Java. We're bringing an Oldie that get your foot tapping and your mind spinnin' as watch the 80's version of what COOL looked like. Tanya Ross is a singer, songwriter and musician. She is a native of Winston-Salem, N.C. At the age of three she began singing and playing the piano. Her influences in music have been inspired by gospel, jazz and soul. By the time Tanya was 14, she began making appearances on local T.V. shows, singing on a few local recording projects and then singing lead with her church choir on Bobby Jones Gospel Show. As she matured, she ventured to college and founded her first band “Ebonique”. They were together for twelve years, and most of her stage experience was developed during that time. Her repertoire consist of music from the 70’s to 2000’s with styles that range from R&B, Neo-Soul, Smooth Jazz/Traditional, Reggae and her Originals. She has released two of her CD’s, “Free As a Bird “and “Baggy Jeans”, which have had rave reviews. Tanya's future to come looks very bright. She often says, "I just want to spread love, healing and hope through music." Tanya thanks the Creator for blessing her with such unique gifts in music. Sharpen those brain cells. Reach back for some oldie info. Compete against friends and family as we host Trivia Night at PB & Java! Enjoy a cold beverage, grilled sammich and be the winner on Trivia Night! Poetry Café: The Kids Edition! If you have a child in elementary school or middle school who has talent for reciting and/or writing, bring them on down. People these are some of the smartest, cutest kids you will see on stage!! Josephus and some of the hottest Spoken Word artists in Greensboro coming out to share their incredible talents. Charlie & Ruth Jones are gracing the stage in July to entertain and inspire. This dynamic duo spent 20 years touring the world (literally) performing their original dramas. And now they are bringing their talents to the stage at 614 S. Elm St.
Transform Tour - Pop-up Show Tonight! The Band was passing too close to Greensboro NOT to stop by and do a quick show. Check it out and be here tonight!! One of our favorites and one of Greensboro's favorites, Mr. B-Rock brings his show, L.I.T. (my Life Is Terrific) to the PB & Java stage. And he will be bringing his friends, poets and a dope Band! We guarantee you a great time. You have the best Saturday night of the whole month... maybe the whole year! B-Rock says, "This new part of my life is what the ancestors made a way for. I promise to use this platform to entertain and empower the community!